Good evening from caffeinated HQ of Esquire Photography in Orange County everyone! I’m one Newport Beach Wedding Photographer who is totally beside himself with all the blessings of exciting Engagement Shoots, Portraits, Quinceañeras, and Weddings I’ve been photographing from Newport Beach down to San Diego and all the way up to Oakland. As if that wasn’t enough going on – I’m sure you saw on Twitter & Facebook the two MEGA announcements I shared this past weekend. One of which is the Military Promotion that launched on Saturday. I had the honour of giving it to Ali & Justin when I was up at Edward’s Air Force Base with both of their parents location scouting and going over details for their Lancaster Wedding Day I’m photographing next August. The other HUGE announcement I shared is the Workshop I’m teaching with my good friend & fellow photographer Danny in Paris France. Can I just say; “Wholly Nachos & Newcastles!” So if you’re in Paris over Christmas break, totally let me know because the workshop is very affordable & only 100 Euros per person. With all this talk about helping brides & grooms who are active in the military save money on their wedding photography and helping photographers with a totally MEGA gorgeous location called; Paris, France save some money with a workshop – it only felt appropriate to share this awesome story from my friends at Elegala on establishing a wedding budget. With the average wedding cost at over $25,000, it’s no wonder tackling the budget is one of the most overwhelming tasks on your to-do list. We’ve come up with a few steps to help you put it all in perspective and build a plan of attack. You’ll need to establish a reliable method to keep track of all savings and expenditures. There are endless ways to save and track your finances, from sophisticated software to old-fashioned spreadsheets. You can download easy-to-use budgeting software at My Wedding Organizer, Five Star Software or Elm Software for $29.95. Awesome – yes!?! 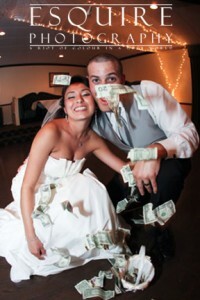 Three quick and easy steps to help save money and stick to your wedding budget. I love it! So you’re thinking… Hey – I’d really like to get to know this Newport Beach Wedding Photographer (Previously a Huntington Beach Wedding Photographer) who helps brides, grooms and photographers save money and loves music & fashion, photography and art, feel free to contact me anytime. Perhaps you’re a fan of Nachos & Newcastles (My favourite snack!) like Duran Rex and I & if so – we could always meet at Fred’s Mexican Cafe on Main & PCH in Huntington Beach. They’re out of this world at Fred’s! I hope you’re having a great start to your holiday season & stay in touch for some more absolutely incredible events that I’m sharing this week. From San Diego to Newport Beach and all the way up to Oakland – I’ll have some fantastic Weddings and events that I’ve had the honour of photographing. And of course, Kristine, Jay, Brian & Lindsay from Darvoset with their MEGA performance where Kate Mesta provided some “One of a Kind” jewelry (which I’m sure you saw from Darvoset’s Riverside Photo Shoot) and be sure to check out the Huntington Beach Photo Shoot of Sarah for her portfolio for The Ford Modeling Agency – Cheers! PS, I just had to use one of my favourite photos I captured at Monique & Collin’s Ventura Wedding at the Wedgewood Buenaventura. They were both a BLAST for their Engagement Shoot & Wedding!